Who would have thought that popping a pill could help prevent falls in the elderly? According to a new report on fall prevention, published in Annals of Internal Medicine, vitamin D may help adults age 65 and older stay steady and upright. Falls are the leading cause of injury in adults 65 and older, and preventing them is much more effective than treating them. Thirty percent to 40 percent of the elderly fall at least once a year; many who had been living independently never regain their previous functioning, ending up in assisted living and nursing homes. According to MayoClinic.com, older individuals have higher instances of vitamin D deficiencies. This deficiency is often caused by poor diet, bad absorption of the vitamin in their intestines, not receiving enough sun light and liver or kidney diseases that affect the metabolism of vitamin D metabolism. 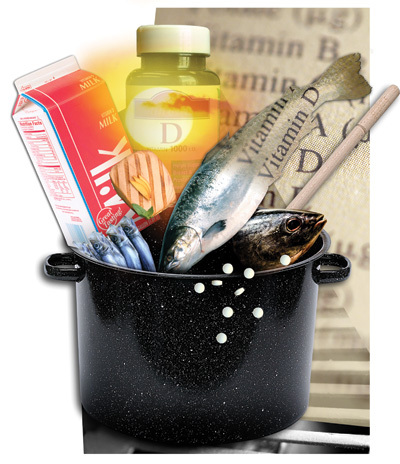 Many people are not aware that they have a vitamin D deficiency. Doctors can check the level of vitamin D in your body through a blood test. Taking vitamin D supplements daily is one of three major recommendations on fall prevention recently issued by the United States Preventive Services Task Force. The task force is the first major medical group to recommend vitamin D supplements for those who live at home (not in assisted living or nursing homes) and are at higher-than-normal risk of falling — that is, those over age 65 who have already fallen or who have had limitations in mobility within the last year. The task force’s last recommendation for fall prevention involves exercise. Appropriate exercise should be any balance, strengthening and aerobic moves the patient likes enough to actually do regularly. Stairs – obviously the most likely place to experience serious falls. Put up railings on both sides. Replace worn carpet, as it can be slippery. Install lighting at the top and bottom of the stairs. Mark the top and bottom steps clearly with a different color of carpeting (tape tends to need replacing too often). Bathrooms – clearly the next big fall zone. Secure grab bars (not the suction-cup variety) into the walls at varying easy-to-grab angles in addition to vertically and horizontally. Place them not only where you enter the tub or shower but also in a second midway spot — for example, where the built-in soap holder usually is, and by the toilet. Good lighting – an easy and inexpensive safety improvement throughout the home. Getting rid of clutter – a critical but not so easy safety measure, especially if you are a hoarder! Pets and their paraphernalia – when our furry friends can also pose a hazard. Confidence is important to fall prevention. Fear itself in this case can lead older people to cut back on activities they used to enjoy. The less they do, sadly, the less they eventually are able to do. For the first time since 2001, the American Geriatrics Society and the British Geriatrics Society have updated their guidelines for preventing falls in older people. The update includes two notable changes: One recommends tai chi as an effective way to prevent falls, while another suggests that doctors review medication use by all elderly patients, with an eye toward reducing use of those drugs that increase the risk of falling. Click HERE for their recommendations in PDF form.